Happy Halloween to all. The photograph of actress Nancy Carroll comes from http://www.lucywho.com/, Nancy Carroll started acting in silent movies, became a big star in early musicals, and developed into a strong dramatic actress. Personality conflicts with Hollywood producers shortened her career on film, but she spent the rest of her life working on the stage and in television. 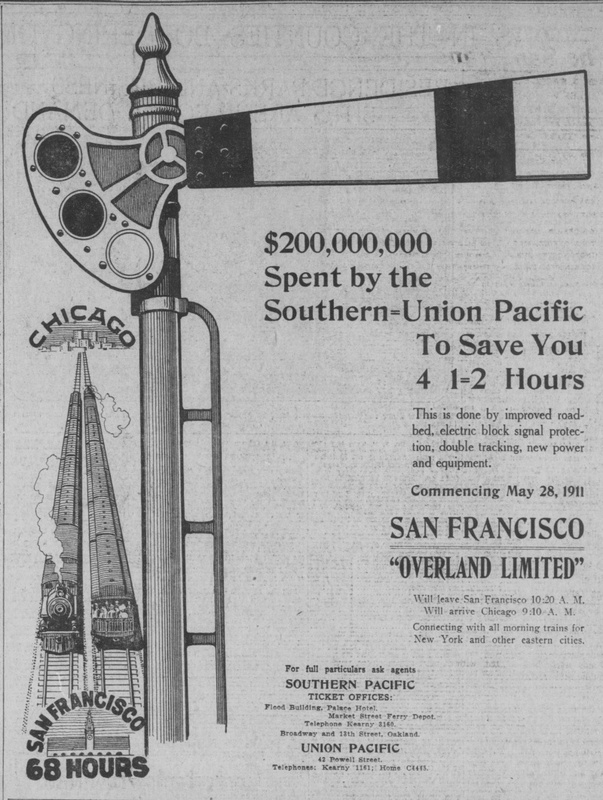 An ad from the 20-May-1911 San Francisco Call touts the Southern Pacific's investments which sped the time of the Overland Limited by 4 1/2 hours. These included the Lucin Cutoff across an arm of the Great Salt Lake. Hillsdale Mall developer David Bohannon commissioned sculptor Benny Bufano to provide sculptures to decorate the new mall in San Mateo. Bufano opened a studio on the mall site in 1955 and created ten of his famous animal sculptures. 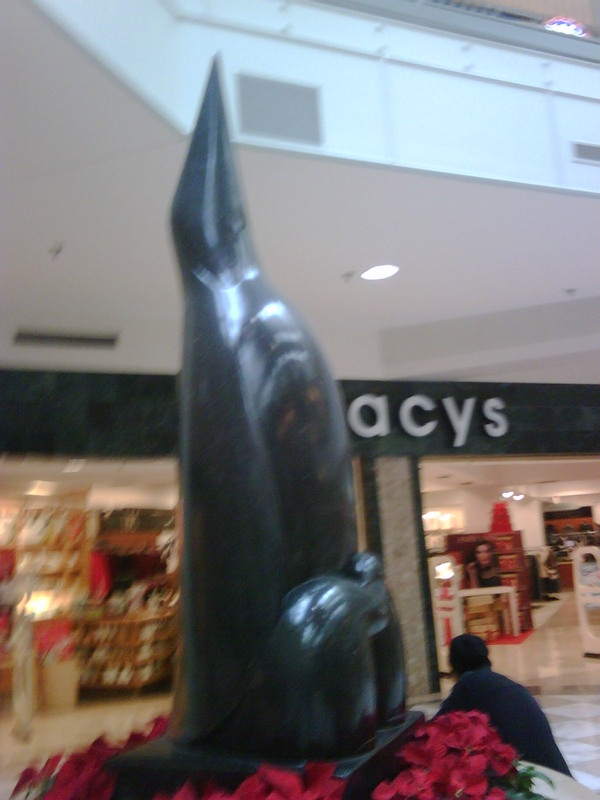 This sculpture, "Penguin Mother" shows a penguin with two babies. This was a popular theme with Bufano (http://cablecarguy.blogspot.com/2011/02/benny-bufano-5-february-23-2011.html). Today we left the house and found that the left front tire on my car was flat. We went to Pacifica Tire and got two Michelins installed in an hour. We walked around Rockaway Beach while we waited and had pumpkin ice cream sundaes at Rockin' Rob's. The San Francisco Arts Commission (http://www.sfartscommission.org/) has set up a series of posters by artist Elisheva Biernoff representing important moments in San Francisco history. 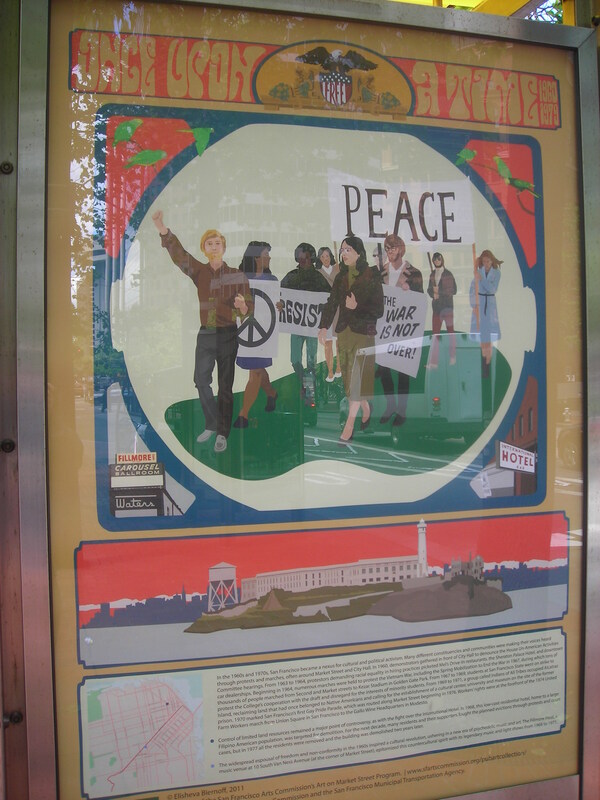 I took this photo on 19-May-2011, showing a poster that depicts the turbulent 1960s and 1970s, with the anti war movement and the Alcatraz occupation. From the 28-October-1898 San Francisco Call. William A Coulter did many maritime drawings for the newspaper. Be sure to click on the image to see the larger version. A Fleet of Deep Water Vessels Reached Port Yesterday. Some of Them Brought Coal From Newcastle, England, and Newcastle Australia; Some Brought General Merchandise From Antwerp; Others Brought Coke and Merchandise From Leith. While Five Carried Sugar From the Hawaiian Isles, The Bark Roderick Dhu From Hilo, Under Her New Commander, Captain Johnson, Made the Fastest Passage of the Year From the Islands. 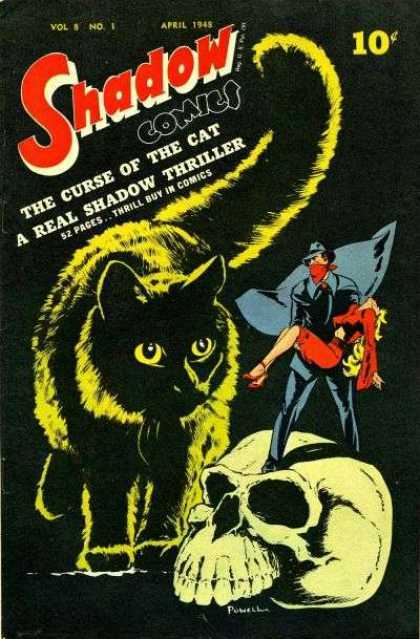 The April, 1948 issue of Shadow Comics features a wonderfully rendered black cat. 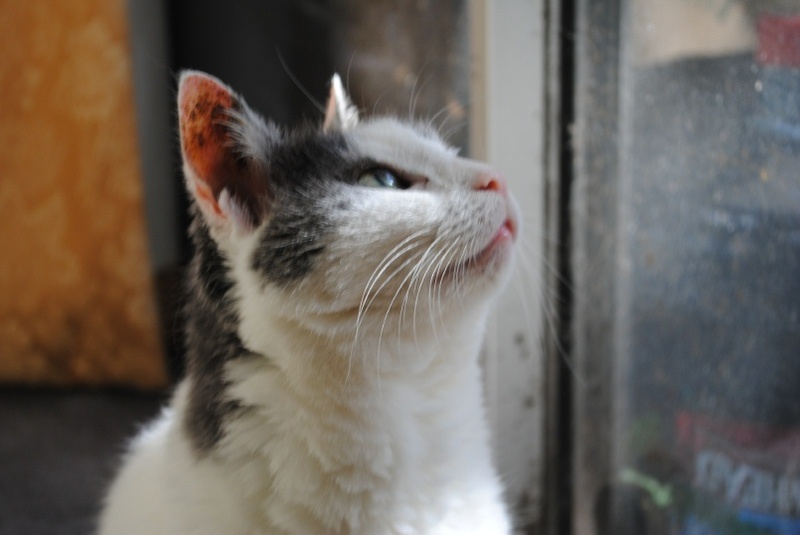 I took the photo on 09-October-2011. When I was walking to work today, I saw a bunch of police barriers staged along Third and Howard. There were several police standing around. The mobile command post was parked in front of the W Hotel. Around 11, Third and Howard got closed off. A large group of protesters gathered around the intersection. I recognized some of them and their signs from Occupy SF. 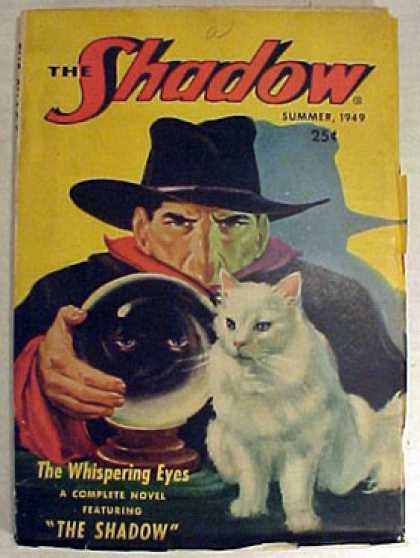 President Obama spoke at a fundraiser in the W.
The cover of the Summer, 1949 Shadow features an image with a white cat (nice contrast to the black-clad Shadow) and what appears to be the eyes of a black cat in a crystal ball. Today I took my mom to the special 10:30 mass to celebrate the 100th anniversary of Saint Monica's parish. Bishop Robert McElroy was the celebrant. Archbishop Niederauer is still recovering from his heart trouble. Concelebrants included pastor Father Greene, Father Sakowski, pastor of Saint Thomas Apostle, two other priests, and a deacon. Father Greene started his homily by mentioning that there were three things in the church to remind us of the first mass in January, 1911. He held up the chalice used in that mass. He mentioned a 101 year old lady who was there, and he mentioned a 90 year old lady whose mother and grandparents were there. There was a buffet in the large hall after mass. I met one classmate and several parents of classmates. The weather was nice and warm. I took the photo this morning. 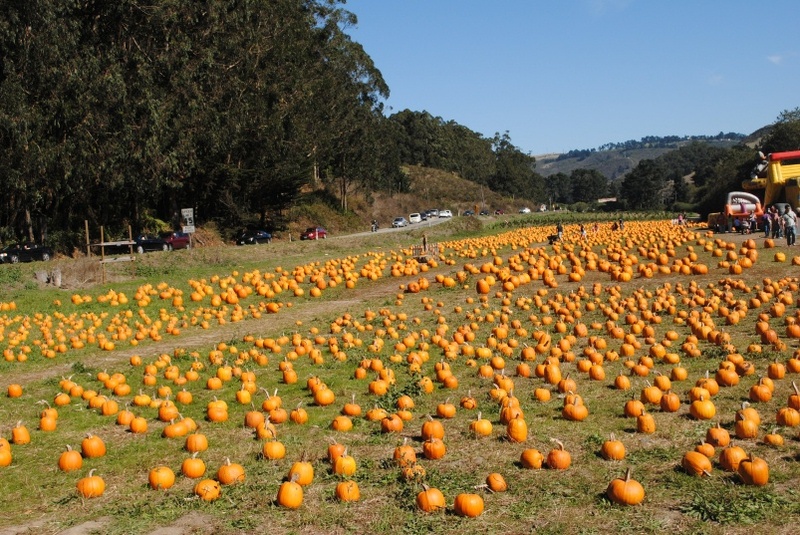 We went to Half Moon Bay today to get a pumpkin. Traffic on One was backed up to at least Princeton. We went to the 4-Cs patch again. I took the photo today. I like the color of pumpkins. A little bit of the traffic is visible in the background. We found two great pumpkins for $12.00. The weather was nice and warm. We went up 92. Traffic was backed up all the way to 280. We drove down to the Stanford Shopping Center and had lunch at Gourmet Franks so we could sit outside. 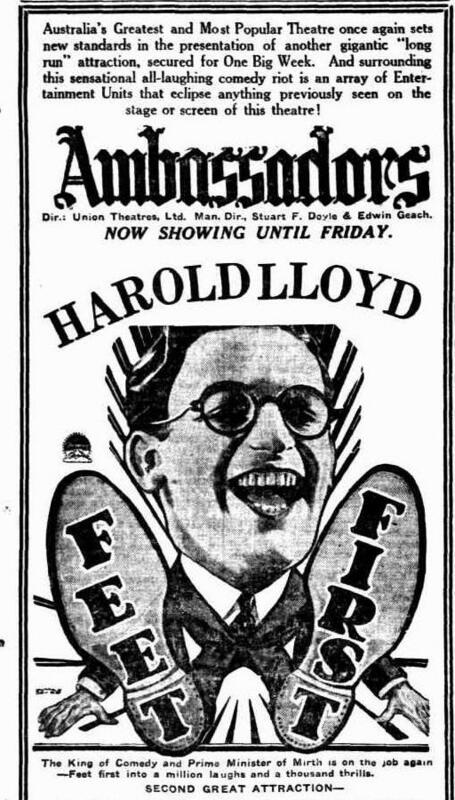 An ad for Harold Lloyd's second talkie, Feet First, from the Perth, Western Australia Sunday Times, 08-March-1931. Feet First concluded with Harold climbing a tall building, as he had in Safety Last. I think the climb worked better in Safety Last because Harold's cries and the other noises made the scene in the talkie too realistic. We had another earthquake last night. The Libyan people finally caught Colonel Gaddafi. I hope they find peace. I was sad to learn that actress Barbara Kent, a native of Canada, has died at the age of 104. She was virtually the last surviving person who acted in an American silent movie as an adult. 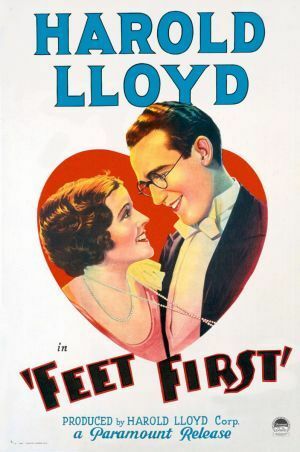 She was Harold Lloyd's leading lady in Welcome Danger and Feet First. Today we were supposed to have an earthquake drill at 10:30am, but it didn't happen. In the afternoon, we had a real earthquake, about a 4.0. I felt one short, sharp jolt. 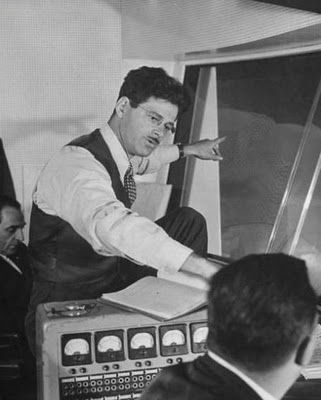 I was sad to learn that Norman Corwin, writer, director and producer of some of the best radio dramas, comedies and documentaries, had died at the age of 101. I remember when Gene Nelson, who played old radio shows at night on KSFO, played "On a Note of Triumph," Corwin's tribute to victory in Europe. I remember when Corwin and Walter Cronkite did a show in 2000 for NPR, I was surprised to learn that Corwin was still alive. They're finally done in, and the rat is dead in an alley back of the Wilhelmstrasse. Take a bow, little guy. Of you common men of the afternoon. The image comes from the wonderful site LucyWho (http://www.lucywho.com/). William Matson founded the Matson Navigation Company, which carried passengers and freight from San Francisco to many points in the Pacific, particularly Hawaii, in 1882. 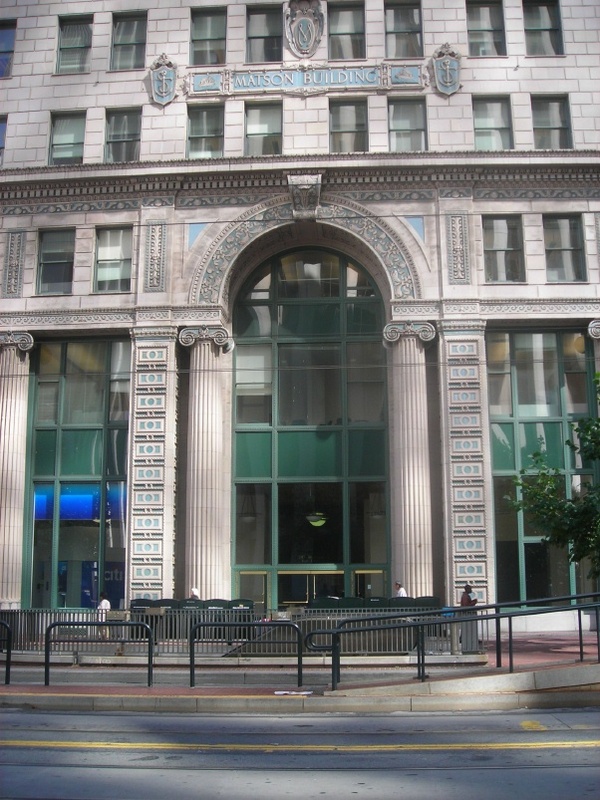 The Matson Building, once headquarters of the steamship line, is now part of the Pacific Gas and Electric Company's headquarters. Matson (http://www.matson.com/) is still the biggest freight hauler between San Francisco and Hawaii. 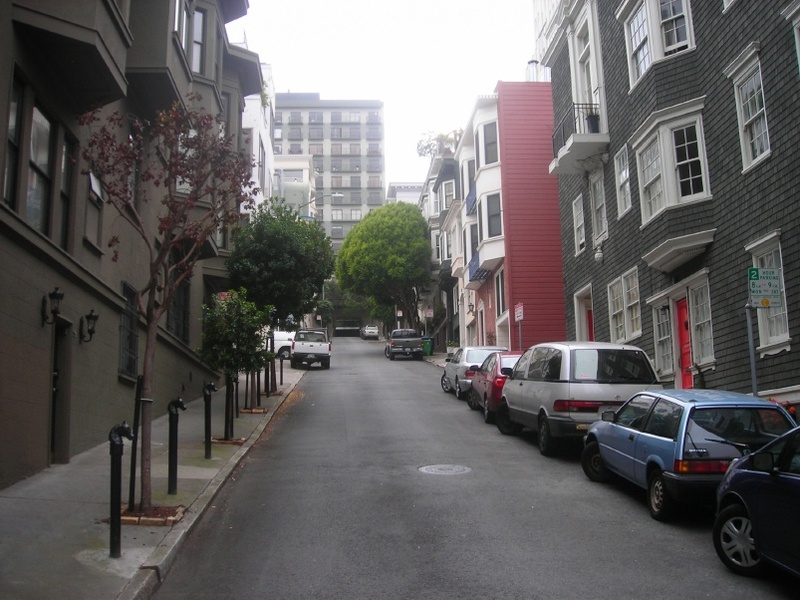 Pleasant Street runs from Taylor to Jones between Sacramento and Clay Streets. I took this photo looking up from Taylor Street on 14-September-2011. The street is named after Mary Ellen Pleasant, who was born into slavery, but freed herself and became involved in the Underground Railroad. She moved to San Francisco and passed for white. She became wealthy by helping a clerk, Thom Bell, at the Bank of California with investment advice. She used her connections and money to help the black community, which knew her true identity. At some point, she went east and became involved with the network that helped John Brown. After his capture, she came back to San Francisco. After the Civil War, she declared her true racial identity and pushed for Civil Rights. After she was thrown off a horse car, she filed a suit, Pleasant v. North Beach & Mission Railroad Company, which established that public conveyances in San Francisco could not be segregated. In later years, various elements, including Thom Bell's wife, began to smear Mary Ellen. They began calling her "Mammy," which she did not like. She lost her fortune and died in poverty in 1904. There is a small park named after her in Pacific Heights. Today we played tourist. We parked at Fifth and Mission and caught a Milan car on the F line. It got to be very full. We got off at Pier 39. It was a warm day, but there was a cold breeze on the pier. We had fried calamari at a seafood place. There was one float covered with sea lions. A few were on the next float. One sea lion slept soundly on the farthest float. A little boy worried that he might be dead. We assured him that the sea lion was alive. We walked along the Wharf to Pier 45, where we visted the Musee Mechanique. The machines had been rearranged since our last visit. There were two baseball-related games that I had not seen before. We played the French Execution. My daughter operated the machine with the baker. We could not find Peppy the dancing clown. We went up Fish Alley. A boat had a radio on and the news said that the Occupy SF people were going to be marching up Market at 3pm. We headed to the F line terminal and caught the Louisville car. We got off at Fourth and walked up to Macy's. There were police barriers set up along the curb on Stockton. Workers were setting up Holiday Lane. We went to Five o'clock mass at Good Shepherd, then had dinner at Subway in Linda Mar. On the way home, we drove on Cape Breton but didn't see many holiday decorations. 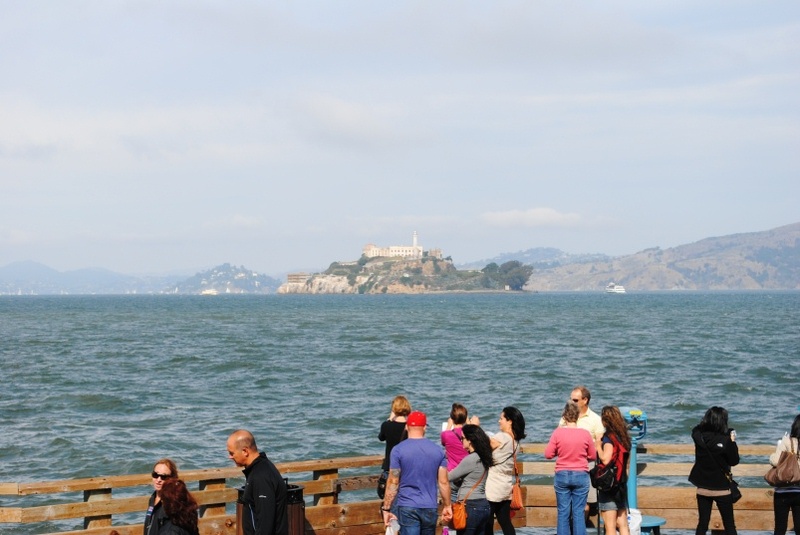 I took the photo of Alcatraz today. 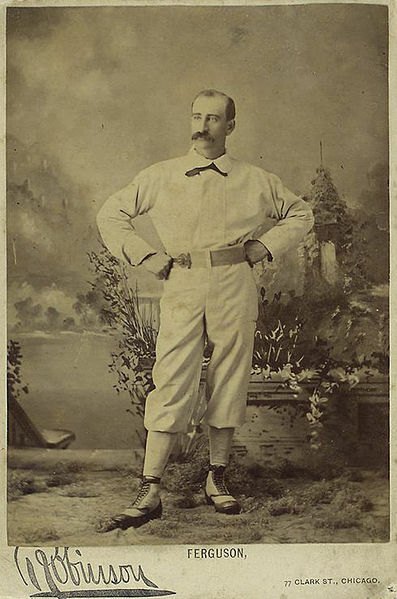 Bob Ferguson had a long and distinguished career in the National Association of Base Ball Players and the National League. He played the infield, managed, umpired, and served as Association president. His defensive skill earned him the unique nickname "Death to Flying Things." The only baseball nickname of comparable length that I can think of is Pepper Martin's "The Wild Horse of the Osage." It was warm again today. Occupy SF protesters gathered outside the Palace Hotel. 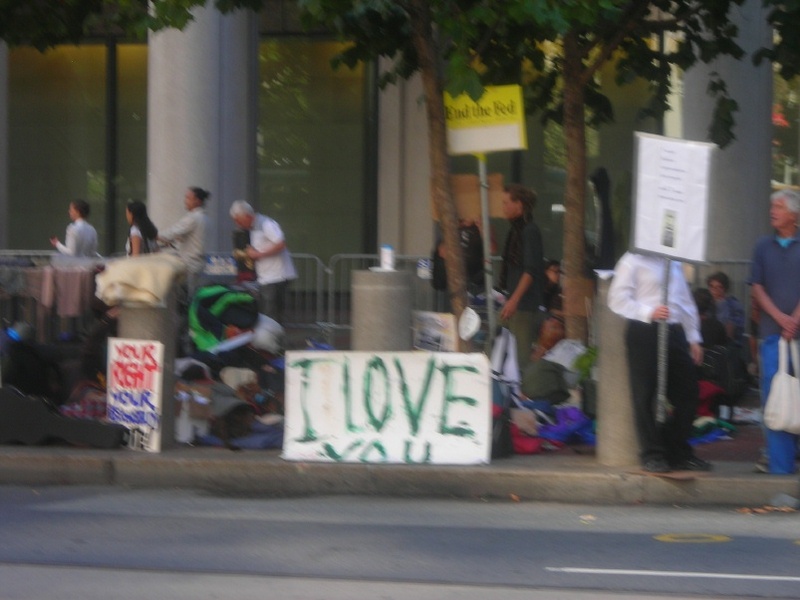 Yesterday I took a photo of the Occupy SF encampment in front of the Federal Reserve. Mayor Bloomberg of New York is going to roust the Occupy Wall Street encampment tomorrow morning. "In American history, the fight to make a holiday on Columbus Day actually had almost nothing to do with the actual arrival of Christopher Columbus in the western hemisphere. It wasn’t about celebrating the European conquest of the Americas or the extirpation of the native tribes. "The day was made a holiday after years of lobbying as a way of recognizing the contribution of Roman Catholics and immigrants generally to American life. It is a holiday to celebrate diversity, not to commemorate the imperial outreach of Ferdinand and Isabella, a deeply regrettable couple who were notorious oath breakers, inquisitors and anti-Semites. "Back in the 1930s there was a widespread feeling among both Protestant and Catholic Americans that Roman Catholics, and especially Catholics from non-English speaking countries, were not and could not be “real Americans”. Al Smith, the popular governor of New York, was the first Roman Catholic ever nominated for the presidency by a major party; suspicion of his religion made his defeat even greater than usual, as many solidly Democratic and pro-Prohibition voters in the South deserted the Catholic 'wet' to vote for the reliably dry Protestant, Herbert Hoover. "For the KKK in those days, Catholics were one of the foreign influences that 'real' Americans had to fight, and many Protestant whites still considered Italians, Greeks and other southern European ethnic groups to be too 'swarthy' to be fully white." One of Zaroff's henchmen was played by Tom London, who may have appeared in more movies than anyone else, from the mid-Teens to the early 1960s. Another was Charles "Blackie" King, who was always worth watching. I enjoyed the credits and introduction for each episode. There was a stirring classical theme, whose name I can never remember. There was a tracking shot of Tom and Tony Jr riding hell for leather, followed by a tracking shot along a rocky hillside that underlay most of the credits. Underneath the cast of characters, there was a Native American crouching, then standing and scanning the horizon, then invoking the gods, then squatting, then standing. The general treatment of Native Americans? So-so. Bob Kortman, whom I loved in Laurel and Hardy movies, played Long Boat, who wanted to be chief. He worked secretly for Zaroff. Tom Morgan was his great rival. I liked the way Long Boat kept calling Tom "My brother" with a great sneer. I lost count of how many times Zaroff said he was going to be "the most powerful man in the world." I liked the wireless telephones he used to communicate with Long Boat and his cowboy henchmen. He used what looked like a text terminal to communicate wirelessly with a buyer in Europe. I first saw this serial on Channel 20's Old Sourdough or Worst of Hollywood. I managed to stay awake late enough each Friday night to see all 15 chapters. I had read William K Everson's disparaging comments on the movie. I didn't agree with him. 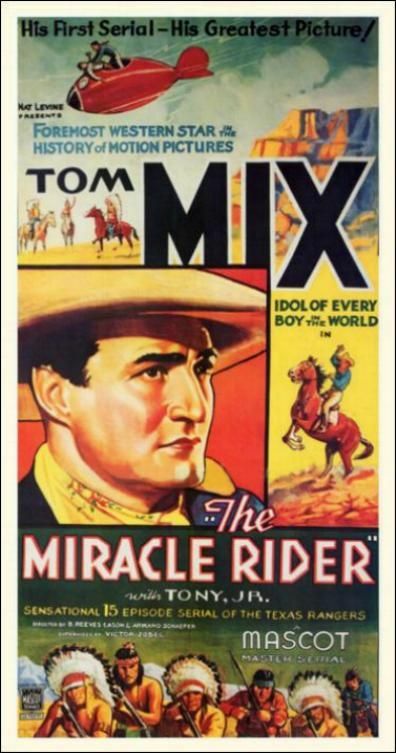 Tom Mix was the biggest cowboy star in silent movies. He made a series of talkies for Universal, but the Depression prevented other studios from paying his vast salary. In 1935, Nat Levine of Mascot Studio paid Mix $40,000 to work for four weeks. This was half the budget of The Miracle Rider, a15 chapter serial. Mix needed the money to subsidize his circus. This turned out to be his last movie. I was surprised to learn that it was Mascot's only 15 chapter serial. I had thought that 15 was the standard length after producers settled on a standard and before they went to 12 as a cheaper standard. The first episode of The Miracle Rider, "The Vanishing Indian," was almost feature length. It used an animated map to show "Indian Territory" shrinking and the United States growing over the years. Some of the dates on the map were questionable. Scenes showed Daniel Boone, then Davy Crockett, then Buffalo Bill Cody, then Sam Morgan trying to get European Americans to stop intruding on the territory of Native Americans. Who was Sam Morgan? He was the father of Tom Morgan, Tom Mix's character. Sam Morgan was trying to defend the reservation of the Ravenhead tribe when he was murdered by a group of men who wanted to squat on their land. Young Tom promises to join the Texas Rangers and carry on his work. Twenty years later, Tom has aged considerably. His hair is dyed black and his teeth are false, but he is still a heroic figure. I only noticed one scene where he performed with is old mugging humor, when he stopped two kids from stealing a pie and then tried to steal it himself. The Ravenhead regard Tom as a brother and give him the name "Miracle Rider." A mysterious flying object, called the Thunderbird by the Ravenhead begins attacking their village. It turns out to be a "rocket powered glider" controlled by Zaroff, who is secretly mining X-92, a super explosive, from the Ravenhead reservation. I was sad to see the open cockpit monoplane Thunderbird crash in chapter 2. Zaroff is played by Charles Middleton, about whom I still have bad dreams from Flash Gordon and Laurel and Hardy movies. Later in the movie, Zaroff's scientist discovers a way to turn X-92 into a powerful fuel that can replace gasoline. Image if a Native American tribe controlled all of this country's energy supplies. Some of the cliffhangers were different compared to what later became standard in Universals. In one, the chapter ends with a bunch of cowboys holding their guns on Tom. There are no shots fired. In the next chapter, Tom's horse, Tony Jr, blows a car horn and allows Tom to escape. There are some very clear cheaters, chapters ending with Tom falling to his doom or getting shot. The next chapters begin differently. Tom Mix was still a convincing hero. I didn't care that he had trouble with his lines. He sounded like a real person. Doctor Peter Henri Van Der Weyde wrote the series of articles which gave this blog its name. 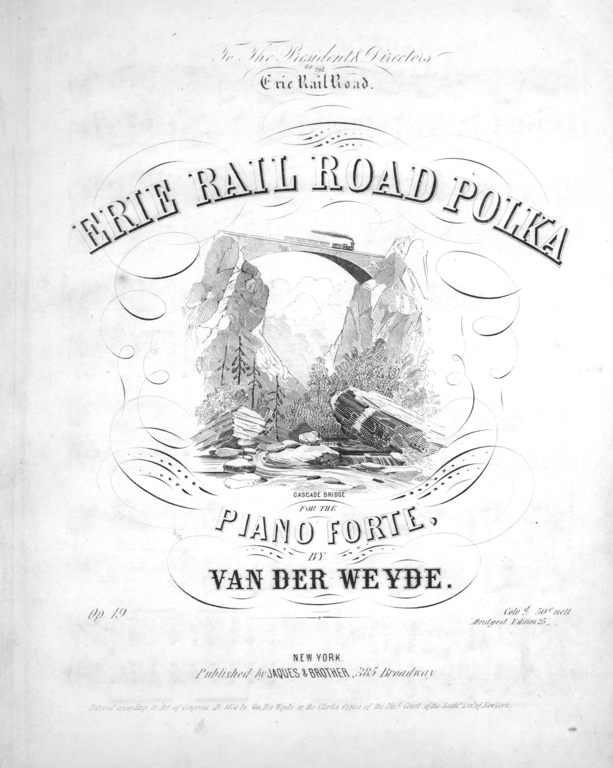 Among his many accomplishments was composing popular music, like the "Erie Rail Road Polka for the Piano Forte" from 1851. The New York and Erie Rail Road was chartered in 1832 to connect the Hudson River with Lake Erie. The builders chose to use a 6-foot gauge. 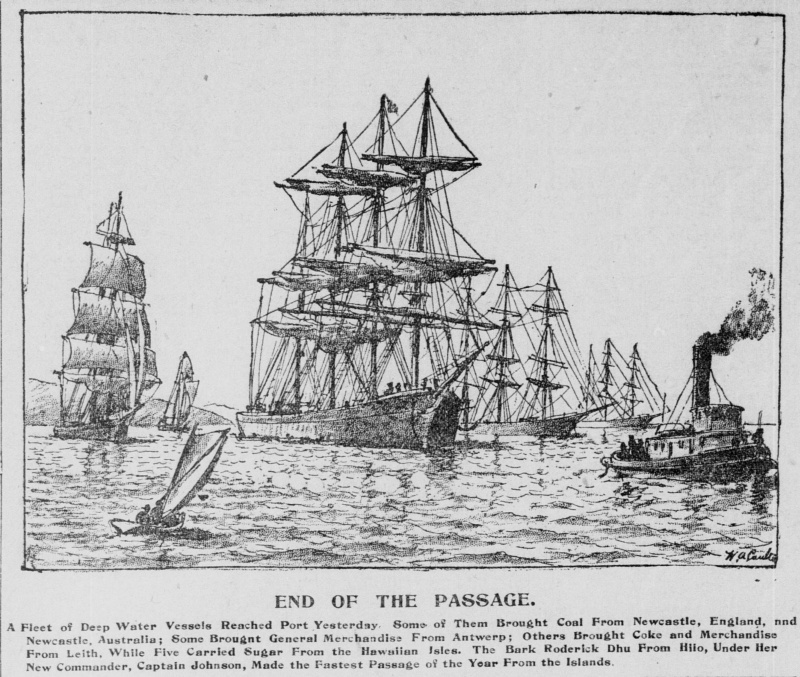 In the 1860s the Erie was the victim of many financial blackguards. The image is from the Lester S Levy Collection of Sheet Music at Johns Hopkins University. Gold Hill Depot on the Virginia and Truckee Railroad opened in 1869. It was in terrible shape when I first saw in the 1970s. 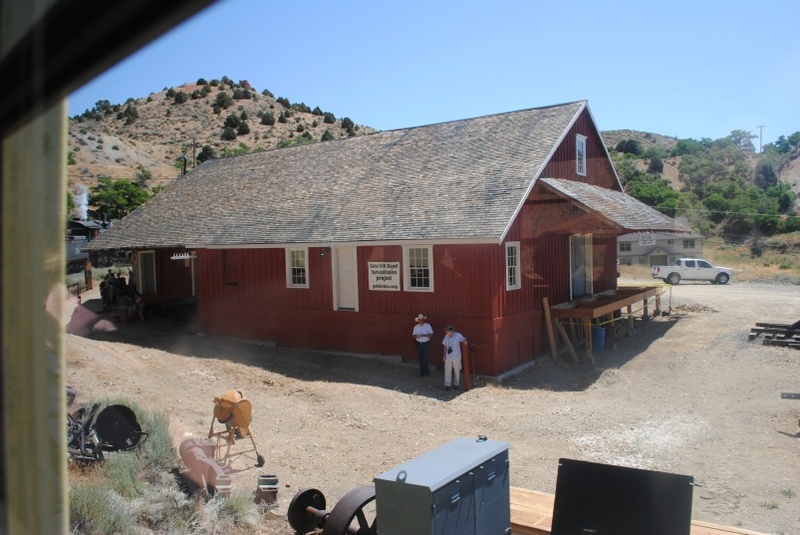 Note the sign for the "Gold Hill Depot Rehabilitation Project." I took the photo during our visit in July. McCloud River engine #18, which was pulling our train from Eastgate to Virginia City, is just visible beyond the depot. It is not over. Today is the 10th anniversary of the start of the Afghan War. American troops have been on the ground longer than they were in the Revolutionary War or Vietnam. I hope they can come home soon. 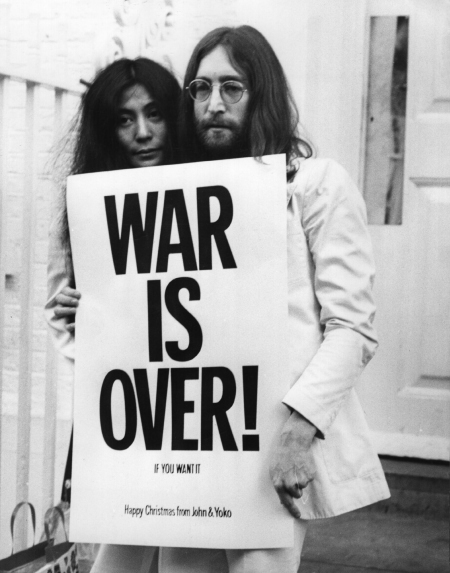 I don't remember where I found the photo of Yoko Ono and John Lennon. 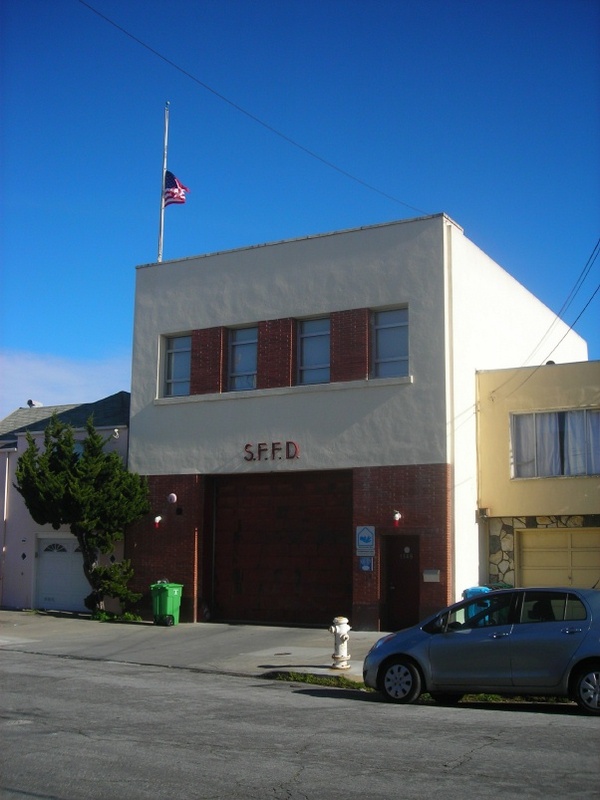 Station 23 is on 45th Avenue between Irving and Judah. I took the photo on 10-January-2011. It rained heavily during the night. 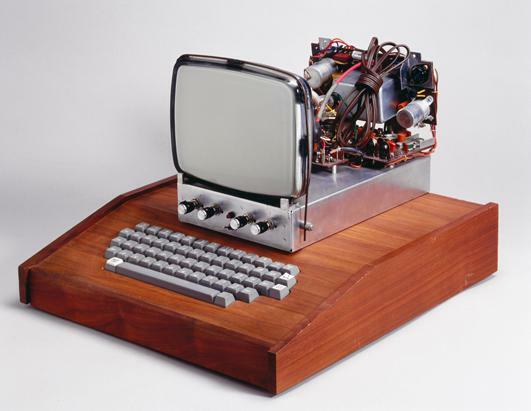 I got started with personal computers in the generation after the Apple I, but I have always liked the look of it. Steve Wozniak and Steve Jobs changed America. I tried the Apple II, but I had already gotten used to the IBM PC. I liked MS-DOS and especially MS-BASIC better than Apple's. We later purchased an early Mac, which I felt was limiting. I like developing things. My wife and daughter love their iPods. 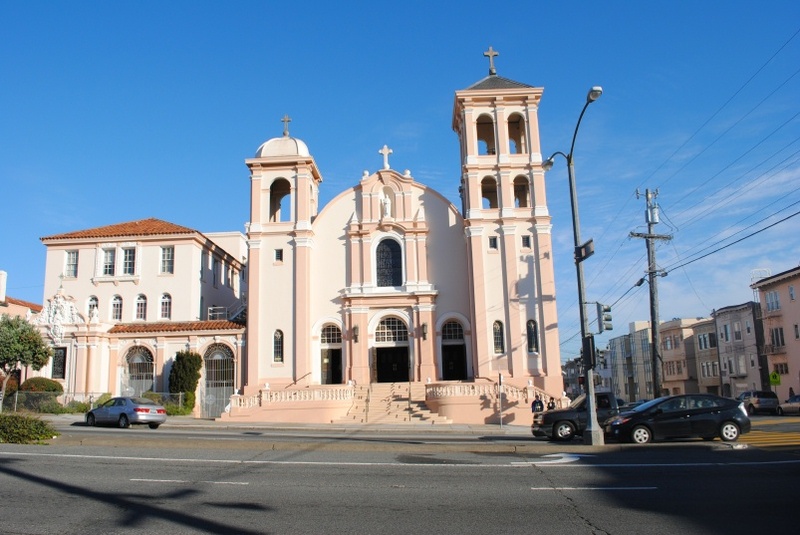 I took this photo of the National Shrine of Saint Francis, formerly Saint Francis Church, on 20-August-2011. 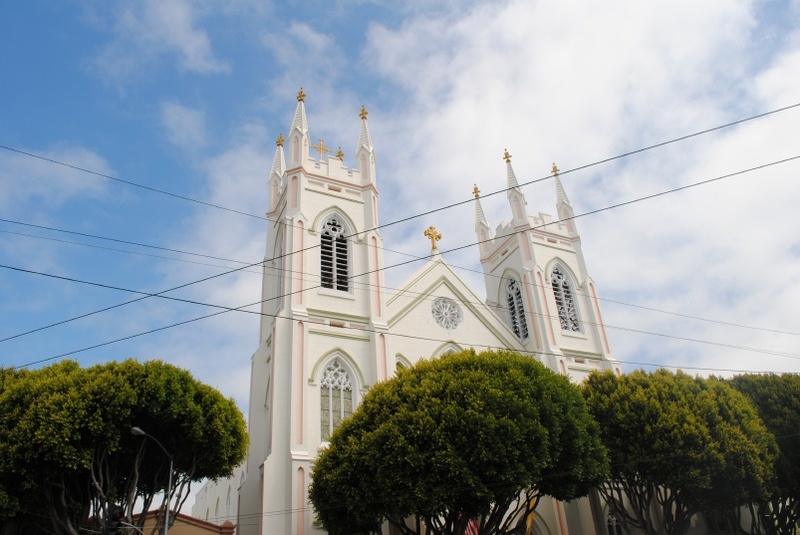 Saint Francisco Church was San Francisco's first parish. "ZERA Semon, the great ventriloquist, is billed to give four entertainments in our town next week, commencing Monday, Dec. 14th. One hundred presents given away each night." "ZERA SEMON AND THE MARIONETTES.-The above combination appears here at Exchange Hall next week for four nights, commencing Monday. As regards Prof. Zera nothing need be said, as he is too well known to need commendation. Besides himself he introduces to Alexandria audiences something entirely new in the way of novelty, Bell's Royal Marionettes. They give a minstrel show and the pantymine (sic) Humpty-Dumpty. They carry all their own scenery, whichl is said to be something grand. Prof. Zera sill gives away night one hundred presents, and no doubt the hall will be tested to its utmost capacity. The admission has been placed at 35 and 50 cents, without extra charge for reserved seats, on sale at Dr. Henry St. John's Drug Store." Frederick Marriott was born in Britain and was a publisher. He had been a partner in the Aerial Transit Company with Stringfellow and Henson. After coming to California for the Gold Rush, he founded the long-lived San Francisco News-Letter and built the Avitor Hermes, Jr. The flight of the Avitor is regarded as the first controlled flight in the United States. A reproduction of the Avitor is on display at the Hiller Aviation Museum (http://www.hiller.org/). Sadly, nothing came of the Aerial Steam Navigation Company after the Avitor burned. This article is from the 31-July-1869 Scientific American. 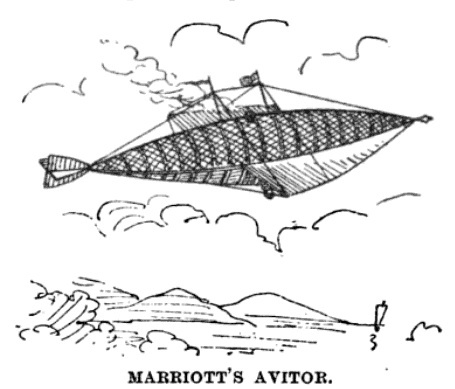 The illustration is from Aerial Navigation by Arthur de Bausset, 1887. In a large hall, near San Francisco, a small steam balloon has lately been tried, with so much success as to excite enthusiasm among the stockholders, and make them think that the great problem of aerial navigation has been solved. We are assured that the first packet of a regular line of aerial steamships will start from California for New York within a very few weeks. We should be glad if there were any reasonable basis for this expectation, but we find none whatever. Substantially the same forms of balloon and machinery have before been tried, always with apparent success on the small scale in still air; always with failure when subjected to atmospheric currents. Experience shows that the attachment of wings, tails, and wheels to balloons, tends more to impede than to assist their progress. Aerial navigation will never be reduced to a regular commercial system until some one shows us how to dispense with the unwieldy gas balloon, and replace it with an effective method of generating the requisite buoyant power. The subject is one of great importance, and worthy of diligent study on the part of all inventors. Glorious fame and princely fortune await the successful discoverer. "The carriage, which is merely a large working model, is a balloon, shaped like a cigar, both ends coming to a point. It is 37 feet long, 11 feet from top to bottom, and 8 feet in width. These are the measurements at the center of the balloon, from which point it gradually tapers off toward either end. Around the balloon, lengthwise, and a little below the center, is a light framework of wood and cane, strongly wired together and braced. Attached to this frame, and standing up as they approach the front of the carriage, are two wings, one on each side. They are each five feet wide at a little back of the center of the carriage, and do not commence to narrow down until they approach the front, where they come to a point. These wings are made of white cloth fastened to a light framework which is braced securely by wires. The main frame is secured in place by means of strong ribbons, which go over the balloon, and are attached to corresponding portions of the frame on the other side. To the frame at the hind part of the carriage is attached a rudder, or steering gear, which is exactly the shape of the paper used in pin darts, four planes at right angles. This, when raised or lowered, elevates or depresses the head of the carriage when in motion; and when turned from side to side, guides the carriage as a rudder does a boat. At the center and bottom of the balloon is an indentation, or space left in the material of which it is built, in which the engine and machinery are placed on framework. "The engine and boilers are very diminutive specimens, but they do their work handsomely. The boiler and furnaces together only a little over a foot long, four inches wide, and five or six inches in height. Steam is generated by spirit lamps. The cylinder is two inches in diameter, and has a 3-in. stroke. The crank connects by means of cog wheels, with tumbling rods which lead out to the propellers, one on either side of the carriage. The propellers are each two-bladed, four feet in diameter, and are placed in the framework of the wings. The boiler is made to carry eighty pounds of steam. When not inflated, the carriage weighs eighty-four pounds. The balloon has a capacity of 1,360 feet of gas. When inflated and ready for a flight it is calculated to have the carriage weigh from four to ten pounds. "As she completed describing the second circle, a pull given to the head line, unintentionally, caused the rudder to shift to a fore-and-aft position when the model pursued a straight flight about a quarter of a mile; she was then turned round, and retraced her flight to the point of departure; whence, being guided, she entered the building. The fires were drawn, and the first extensive flight of a vessel for aerial navigation was accomplished. The total distance traversed was a little over a mile. The appearance of the vessel in the air was really beautiful. As seen in the building she looks cumbrous and awkward. The change of appearance as she is circling gracefully through the air, is equal to that of a ship when first seen in the water. The moment of opening the steam valve was one of suspense; as the vessel rose and forged slowly ahead, the suspense was scarcely dissipated; but in a very few seconds her speed increased—in obedience to the rudder she commenced to swing round the curve—the men at the guys broke into a trot, and cheer upon cheer rose from the little group of anxious spectators. "The public exhibition was attended by some slight accidents, but elicited much enthusiasm from the audience which had assembled in a hall where the trial was made. The wind was so violent and irregular without, that it was considered unsafe to risk the model beyond the shelter. The carriage mounted near to the roof with a firmness and steadiness equal to the movements of an ocean steamer on smooth water. The guests cheered long and loud, and many fairly danced with delight at the success. The trip back and forth across the hall was performed several times with success. "Within a few weeks the first large vessel will be completed by the Aerial Steam Navigation Company—one calculated to carry four persons—and the principles involved in its construction will then be fully tested. The projectors consider that the model carriage has developed two facts of the greatest importance. First, the effective power developed by the propellers is greater than the estimated power according to the formula; of aero-dynamics; and, second, the atmospheric resistance encountered by the vessel was less than had been calculated. Consequently the speed attained was higher than was estimated, and at the next trial, when the effective heating surface of the boiler will be increased, a further considerable increase of speed will be attained. Some doubt had been entertained as to the facility of steering the vessel. That is shown to be the easiest part of the business. She obeys the deflections of the rudder with extreme sensitiveness, and is under the most complete control." We have been seeing some interesting clouds this week. The weather has been muggy. 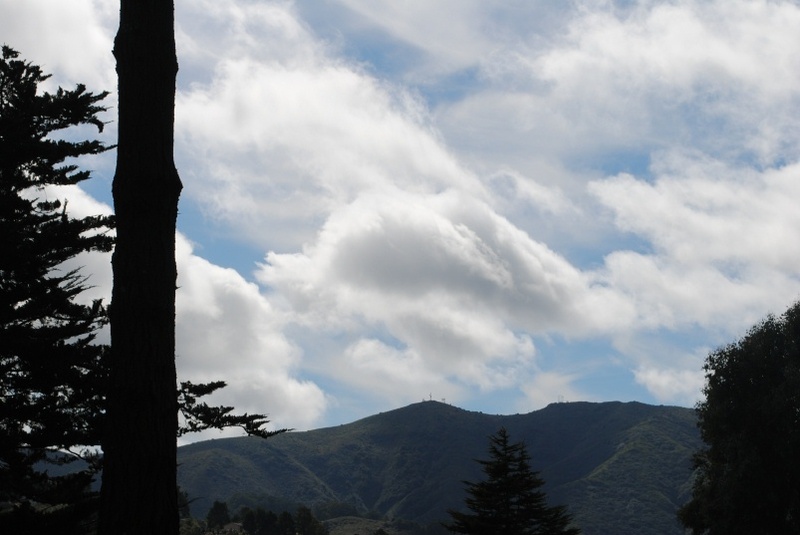 I took this photo today in Pacifica. This morning we went to Kaiser to get our flu shots. Then we went to the Stanford Shopping Center. A lot of stores have closed and several are moving. We had lunch at Gourmet Franks. We went to five o'clock mass at Good Shepherd. Father Jack said if he wasn't there, he would have been watching Notre Dame play Purdue. He led the congregation in a chant of "We Are -- Irish." Before mass, we started learning one of the new prayers. After mass, we picked up a list of the revised prayers and responses.